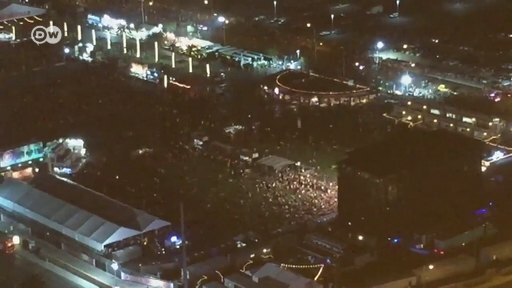 For a second year in a row, the Route 91 Harvest Festival had been sold out months in advance, with Jason Aldean, Eric Church and Sam Hunt headlining this year's event in front of around 40,000 fans. Known as the "three-day neon sleepover" among country music lovers due to the festival's glitzy location on the central Las Vegas Strip, the event will now have much darker associations. Aldean, a country music superstar, was performing on the closing night when shots began ringing out mid-song. He was quick to express his devastation. "Tonight has been beyond horrific. I still don't know what to say but wanted to let everyone know that me and my crew are safe," he wrote in a statement on Instagram. "It hurts my heart that this would happen to anyone who was just coming out to enjoy what should have been a fun night." Since his self-titled debut album and first number one single in 2005, Aldean has become one of the biggest country acts in the US. Hit songs like "The Truth" currently have around 30 million views on YouTube. Other headliners this year included country rock singer-songwriter Eric Church, who has collaborated with Keith Urban on six number one hits – his 2016 album "Record Year" also reached number one on the Country Airplay charts. Church performed to adoring fans on Saturday, the second day of the Route 91 Harvest Festival. These acts were the first-rate headliners at a festival that wanted to remain intimate and not outgrow itself – which partly explains why it is so quick to sell out. The festival (as seen in the tweet from Saturday) was known as much for its special atmosphere as for its high-profile performers, who also shared the stage with country music up-and-comers. "I do believe Route 91 has a certain cachet to it," said its co-creator, Brian O'Connell, who is also president of Live Nation Country Music, in an interview last year with the Las Vegas Review-Journal. "People know what they're going to expect. It's not just about the artist. It's a three-day pass. They're making a commitment to come for the weekend." That special atmosphere has now been overshadowed by Sunday's shooting.